Wow! Did that just really happen? With a resounding note, Ryan and Chelsea Neil have reinvigorated American bonsai. What we saw last month was the seminal point of bonsai here in America. We finally have a voice. We now have expression and a shared vision for the future. Kudos go to Ryan, Chelsea, and their whole team for presenting trees in such a refreshing manner. I just loved it. The attention was solidly focused on the trees, and not the trappings. I spent three days on the floor and never got tired of it. I doubt this will become the de facto standard for exhibits, simply because it takes so much technical prowess and financial investment to pull it off, but it will influence all exhibits for years to come. I know that other exhibits have done something with dark lit rooms, but nothing like this. This was throwing out the rules and see what we can create. Every time the Neils made a leap of faith they stuck the landing with near perfection. Well done. Most of you reading this article put considerable time, effort and talent into making this great event happen. Whether showing up a day early to build the great rhomboid erector set for the displays, ushering folks through the exhibit, or manning the swag tables, you put in a ton of hours, all for the love of bonsai. A few of you even spent days, months, and years preparing trees, stands, and accents for the exhibit. Twelve to be exact. That’s 17% of the entire exhibit developed, owned, and maintained by the good ol’ BSOP. Not only that, but outstanding BSOP member Randy Knight took home the top prize for not only the top tree but also the best accent planting. Way to go Randy!!!! Way to go BSOP!!! All of this speaks volumes to the artistic excellence that BSOP has been pursuing for so many years. 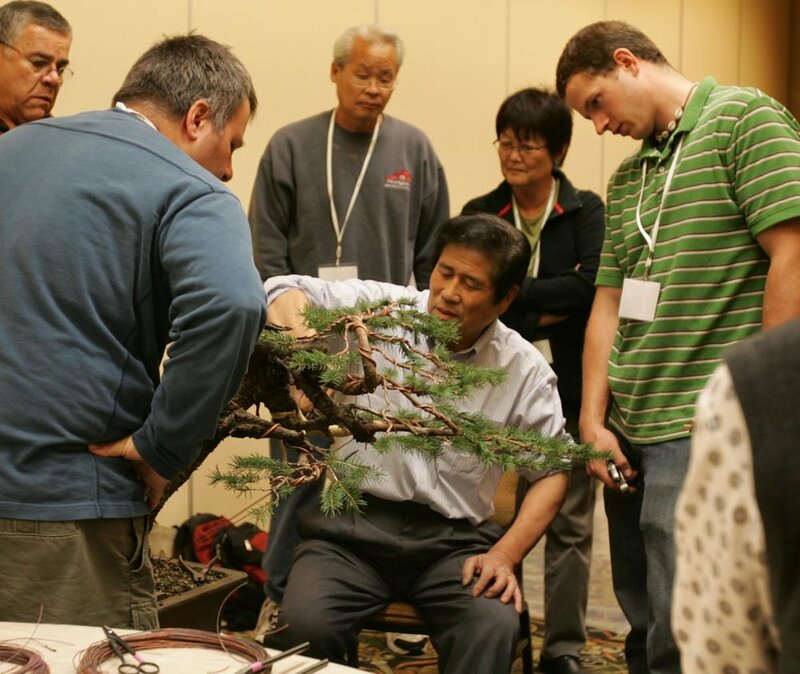 We sit at the very epicenter of the emerging American bonsai movement and it shows. We might be able to just blame some of this on proximity. It seems natural to say that, of course there were more trees from Portland because it took place here. Well to that I say, true, it’s a lot easier to submit trees to the show without needing a cross-country trek, but all that stops at the jurying process. All of those BSOP trees had to make it through the scrutiny of Mike and Ryan before they could ever make that trip across town. (I was probably the closest exhibitor at roughly 15 minutes away, as opposed to say, the 3,000 miles from New York) It also means that they beat out the other 230 or so entries that were submitted for inclusion. So congratulations Portland, on a job well done. Most of you were at the show and/or have seen tons of photos. What I show here is just a reminder of all the great trees from the BSOP. I think that the one thing that stuck out most to me artistically besides the general presentation, and where this show really made its mark noticeable, was in the display stands that were utilized. What we were saw were many different styles from traditional Japanese and Chinese designs to fusions with contemporary furniture motifs. I think that all but one were wooden (Remember the metal trolley under the giant climbing hydrangea?). Some were rustic, like Lee Cheatle’s fence boards – how did he find those chunky, weathered boards the exact length needed? Some stands were missing parts – Randy’s winning tree sat on a table missing itsfourth leg, with the magic of 80 pounds of ballast keeping everything steady. Many were crafted locally in Portland or in Seattle, with forms yet unseen in bonsai – cantilevers, early American touches, and such. Credit BSOP member Jan Hettick with TWO stands in the show that went uncredited at the show – her wonderful stand for Eileen Knox’s Scots Pine and the lovely Bloodwood stand she made for my own Engelmann Spruce. Bob Laws also made a great stand for his display. I thought his whole display was very well conceived and executed. It had its own unique personality, speaking strongly, but softly. I even got into the act making a live edge stand for my Ponderosa. This was the real coming out party for American species of bonsai. Sure, we have seen Redwoods, Ponderosas, and California Junipers for years. But this show is the first one were natives dominated the scene and more importantly, showed mature development. We still have a long ways to go, but everything is clearly on track. 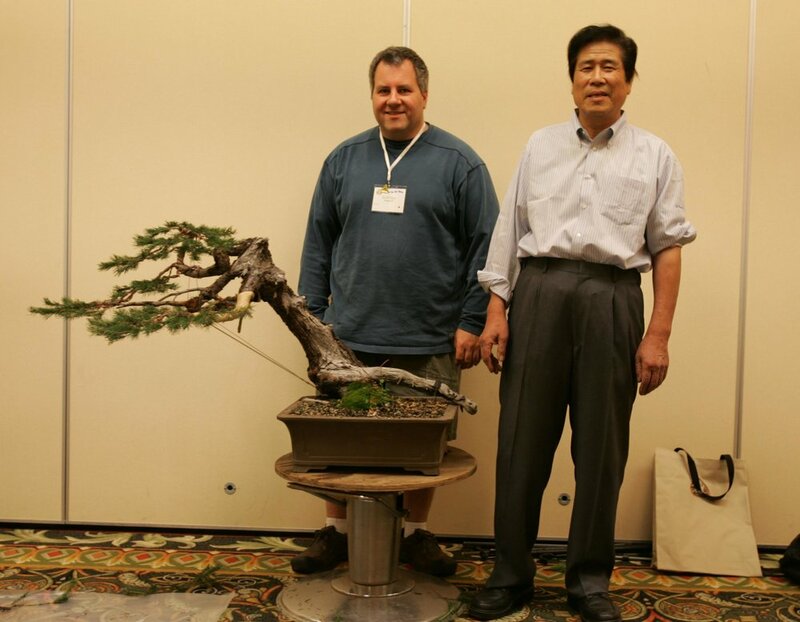 I have watched Randy’s winning Rocky Mountain Juniper for several years, including times when it didn’t go into other shows. The rapidity of its development is just shocking. But it came with persistent, expert care and technique, lots of fertilizer, and lots of sun. But nothing that you can’t actually do. I can’t wait for the release of the online catalog with judges’ audio comments on every tree. I am most anxious to hear insights into my own trees and how I might improve them. I am already reexamining a tree from the show and how to redesign it. The show is over and now it’s time to get back to work. There is a lot to do before the next one! Grand Prize Winner, Rocky Mountain Juniper – Randy Knight.